Ariel Aufgang Architects is designing an eight-story, mixed-use development at 2630 Frederick Douglass Boulevard in Harlem. Also known as 275 West 140th Street, the 55,847-square-foot project will have 54 apartments, according to the plan exam application filed November 22nd. The building will have bike storage, outdoor recreation areas and 8,024 square feet of retail space, along with public and private terraces on the seventh floor. The developer is Great Neck-based Radson Development. 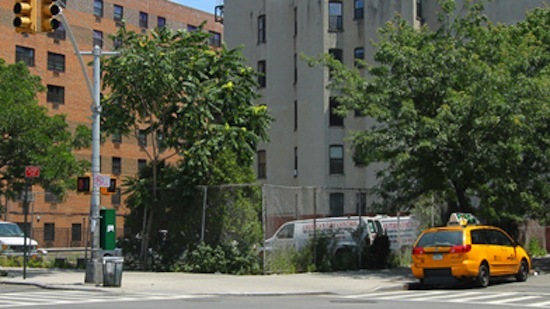 The property, currently a vacant 100-foot-wide lot, traded to Abyssinian Development Corporation in 2010 for $3 million, according to public records. Two years later, Abyssinian sold the land to Frederick Douglass Realty LLC for $3.027 million. Ariel Property Advisors handled the October 2012 deal, representing both seller and buyer.